As the director of the new show “Nothing to Hide” at The Pershing Square Signature Theatre astutely points out in his Playbill note to the audience, there are two types of people who watch magic: those who simply enjoy the spectacle and those who try to figure out the secrets behind the trick. Despite the director’s welcome suggestion to be a person who enjoys the spectacle, I am not that person. It’s not how I am wired. Resolving a puzzle is gratifying, but the process is far more interesting. Knowing the intricacies behind showmanship makes the showmanship all the more impressive to me. But, I did my best to suspend disbelief and ultimately found my night at Nothing to Hide both impressive and enjoyable. Nothing to Hide is, at its core, a magic show. 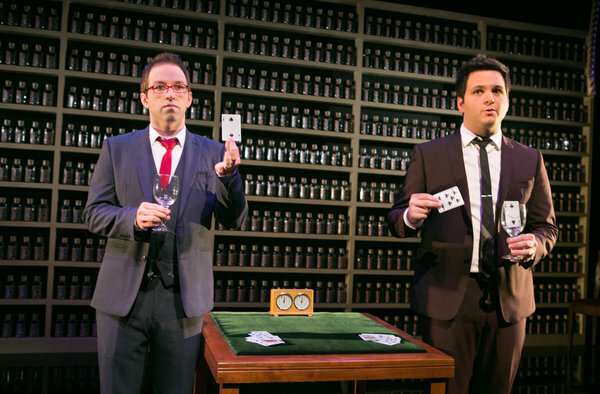 The show is comprised of a series of slight of hand tricks with a theatrical twist, and the purveyors of the magic are the charmingly funny duo of Derek DelGaudio and Helder Guimarães. During Nothing to Hide, DelGaudio and Guimarães recount their efforts to get the show produced and poke fun at their own profession (and frequently at Guimarães’ ethnic background), but the production is generally plotless, which could be a bit surprising for someone expecting to see a traditional theatrical production. Do not let the nature of the show keep you away – it is refreshing to see a unique show like this playing on an off-Broadway stage. The show is aptly named – there is something admirable in the simplicity of the striking set. Big and flashy magic shows are far less impressive and mysterious because there are a plethora of bells and whistles to hide behind. If anything, a magician who relies on these mechanisms of diversion has successfully done little more than distract the audience, which is hardly a feat in the multi-tasking, plugged-in world that we live in. Give me an iPhone with Candy Crush to waive in front of most people, and I can probably pull off an illusion or two as well. Slight of hand strips all of that excess away and depends heavily on the presentation of the magician. And DelGuadio and Guimarães have got their presentation down to an art. They play well off of one another and genuinely appear to enjoy performing together. They also heavily employ audience participation to dispel any thoughts of planted audience members – no financially responsible theatrical producer would dare waste the potential revenue from that many seats during each performance – and they immerse the audience in the on-stage illusions. This approach is very effective. After all, it is nearly impossible as an audience member to disengage from a performance when you have a monkey thrown in your lap and are asked to select a bottled playing card from over 100 identical glass bottles on a shelf. Just trust me on this one. The magic is not flawless. Although the execution of nearly all of the tricks remained a mystery to me, I did discern how a few of the more traditional slight of hand tricks were done. Of course, it could have just been an off-performance when it came to those particular routines, and I highly doubt that most of the audience noticed or cared about the subtle tells indicating how the illusion was being created. No, the magic itself is remarkable and dazzling in Nothing to Hide – it is the venue in which the magic is housed that provides the greatest entertainment hurdle for the show. Specifically, the theatre is just too large for a slight of hand magic show. I sat a little higher than halfway up the theatre and frequently found myself taking the word of my fellow theatregoers that DelGuadio and Guimarães had indeed produced whatever random, audience-selected card that the magicians were meant to produce – a seven of spades might as well be a two of hearts from where I was sitting. Seeing is believing, and if I struggled to identify the magically produced cards, the half of the audience sitting behind me might as well have been blind. It’s tragic really because the audience members sitting in the first half of the theatre seemed to be suitably astounded (thankfully, I am a remarkably trusting New Yorker and was content to go along for the ride). Altogether the creative team and cast of Nothing to Hide were successful at integrating theatrical elements into a magic show and the result was a cohesive theatre experience unlike any that I have had in recent memory. The exemplary result was not particularly shocking to me; after all, the aforementioned perceptive director of Nothing to Hide knows a thing or two about integrating magic and theatre. He stunned Tony Award audiences this year by disappearing on stage only to show up minutes later dancing down an aisle with a handful of Newsies in tow. I am talking, of course, of the multi-talented Neil Patrick Harris who, in addition to hosting award shows, holding down a wildly successful television program, appearing in the occasional movie, and prepping for his upcoming Broadway performance in Hedwig and the Angry Inch, also serves as President of the Magical Arts Board of Directors (and still found the time to direct Nothing to Hide). However, although Mr. Harris’s vision undoubtedly transformed this magic show into a fully conceived theatrical production, the heart and soul behind Nothing to Hide is the talent of DelGuadio and Guimarães. Logic be damned – these two gifted magicians are a pure joy to watch. Nothing to Hide will run until January 19, 2014 at The Pershing Square Signature Theatre, and audience members must be 16 or older.